Did you ever feel like the sun had something personal against you? I went out with the dogs for a walk, and it was sunny for about 5 minutes, and then hubby and i went out for a photoshoot and the 18 mile and hour winds, and cold became the weather of the day. Well, despite the cold and wind, I styled this look featuring my new Jambu Rio sandals in taupe. As a reader, you can get 20% off any full priced style using the CODE STYLISH18. When I looked on the Jambu site, I chose these as I love the architectural style of this blocked heel, and loved it in taupe for a sandal that would go with anything! You know Jambu’s comfort, memory foam footbed and quality. I love it! I wore these to dinner the first night in New York. 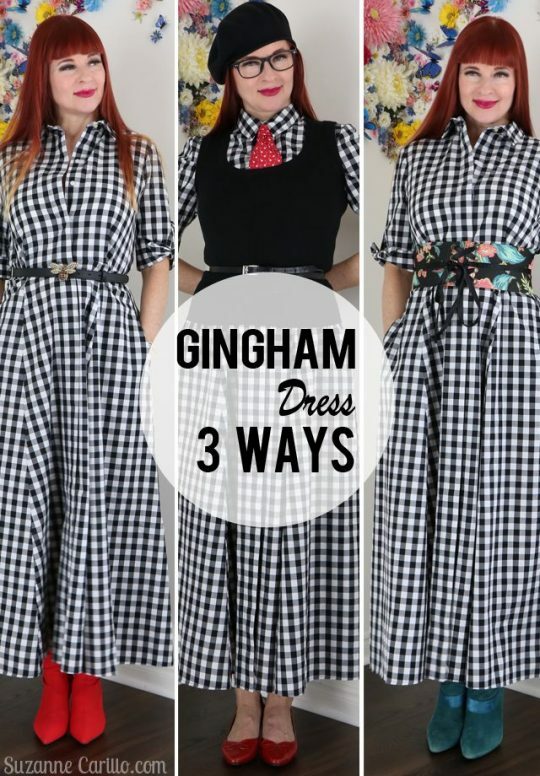 They will be so versatile with jeans and dresses, as well as shorts. I have showed you several styles of new arrivals for Spring. Which are some of your favorites? 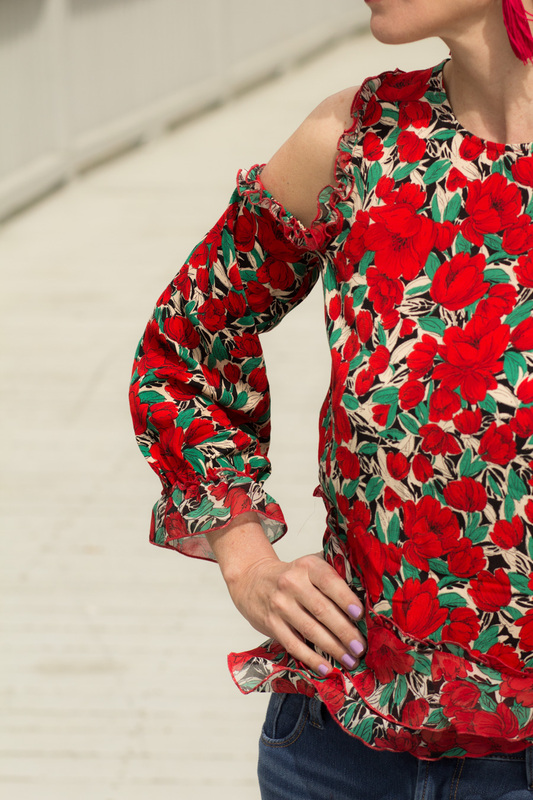 I saw this red floral poppy top, ( I have a thing for poppies) with its ruffled, cold shouldered, flowy style and fell in love! Red is in the top 3 of my favorite colors and I love the chiffon ruffles at the bottom of the top. 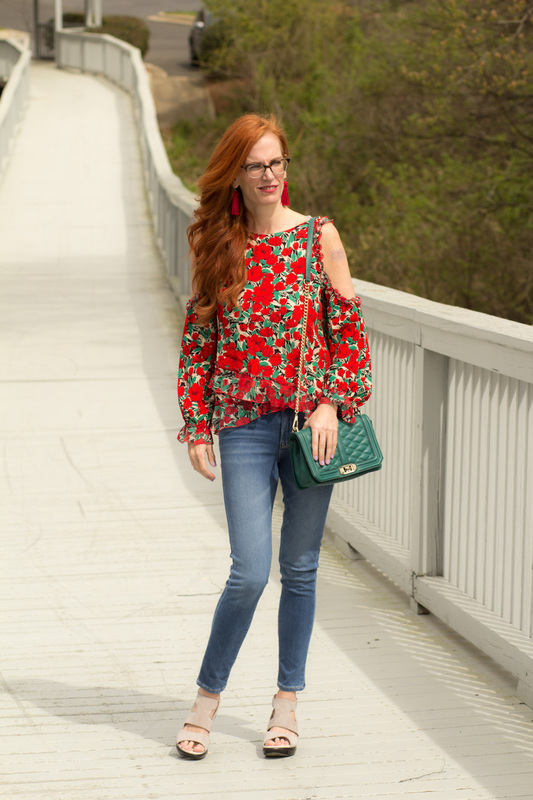 I am a newbie with cold shoulder tops, and after wearing this, I may have to try a few more! Plus the fact that my mom told me Poppies are a Ukrainian flower and I am half Ukrainian, along with Irish and English. My lighter wash jeans are some of the most comfortable denim ever. Old Navy 24/7 Rockstar, fit me to a tee and the softness makes them my favorite denim of choice! 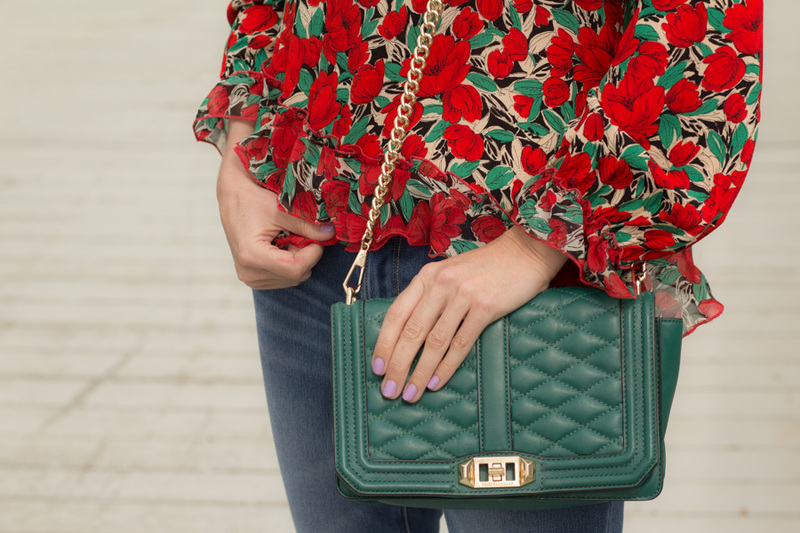 I added the punch of ivy green that is in the top, as my Rebecca Minkoff Love bag. Hubby’s birthday is this week, and we are looking forward to seeing Wynton Marsalis and the Jazz fastival along with going out to dinner at Uptown. I love jazz, but I am a fan really of so many styles of music. We have some concerts planned this year, I”ll tell you about later, but lets just say, I get to let my inner rocker out! Now, back to my Jambu shoes. You know I believe in this brand, and just love the comfort and fashionable style. Did you know that they have an all woman team of designers? I look at some shoes and think “a man must have designed those!” These Rio heels come in taupe, denim and black. The supportive base , all terrain outsole, makes them so easy to walk in, I also love the memory foam which can’t be beat! I really don’t feel like i am wearing heels, except for the fact that I am 6ft tall with them on. 🙂 Do follow me on INSTAGRAM if you don’t already, I may just be having a JAMBU giveaway in the future! Whether you are looking for comfortable wedges, flats, sporty styles or more fashion forward looks, Jambu has them! AS A READER, DON’T FORGET, YOU CAN USE THE CODE FOR 20% OFF ON JAMBU.COM, USING CODE STYLISH18 ! outfit detail: *These sandals were gifted to me by Jambu. All opinions are my own. TIME TO PARTY! LET’S LINKUP AND SHARE YOUR IG POSTS, BEAUTY , LIFESTYLE AND FASHION BLOG POSTS. PLEASE COMMENT ON SEVERAL BLOGGERS EACH POST. 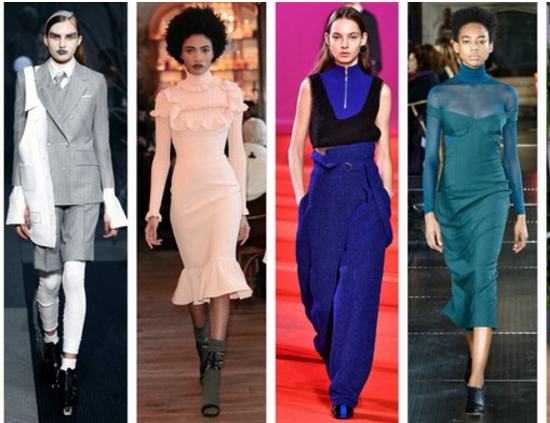 Fall Trends- Which Would You Wear? This is a pretty adorable look. I would love to have sandals like this. It has that spring vibes we want. Your top is so beautiful and it is my one of my favourite colours. Those sandals are so cute too! You look lovely Jessica! 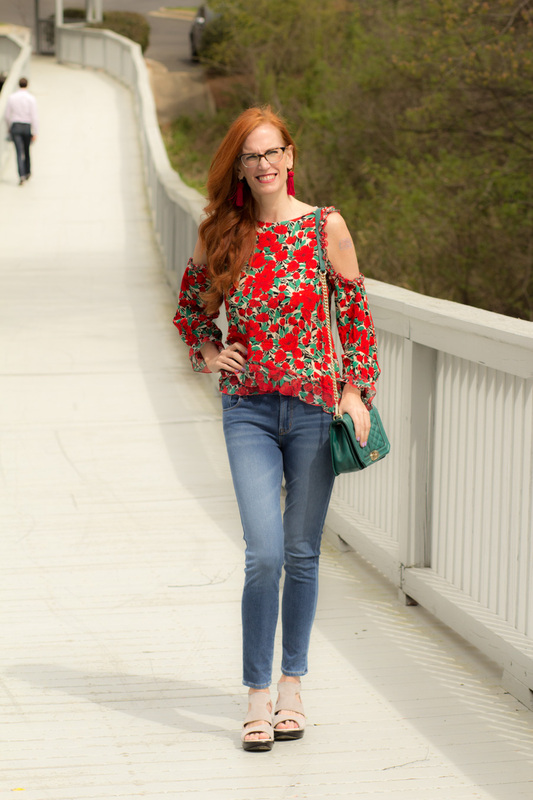 I love the poppy shirt paired with the light wash denim…and of course the Jambu shoes – how cool that the designer team is made up of all females; cool and inspiring. Love that purse matches the green in your top so perfectly! Have a wonderful rest of the weekend! Your shoes are so cute! And I really love your top, too! What camera and lens do you guys use to shoot? I love how crisp your photos always look! I love that top! Those shoes look like they will go with so much. I really do love this OTS top, so vibrant and red is so pretty on you! I also love those sandals and their low heel! That top is GORGEOUS! So flattering on you with your skin tone too!! That top is so perfect for spring. I love the floral pattern. I love so many things about this outfit – the zipper detail on the sandals, the earrings, the cute bag and how it goes so well with the top – perfection! I love this red and teal green! I have a top with these same colours from Anthro that I adore. Once it finally warms up a bit here I’ll bring it out. We have not had any signs of spring at all here. In fact there were some snow showers this afternoon!!! UGH!!! Seriously. Not. Cool. That top….wow, I love it and it looks incredible on you Jess. I love red hair and red, so pretty. Ha, yes, I think the weather does have something against me, as it’s about to rain again and I have a pounding headache! I’m glad you were able to squeeze in a shoot—this is such a cute outfit! I especially love your bag and how it picks up the green in your top! That top is absolutely gorgeous! I love the bright print! Those neutral wedge sandals are perfect with it! Loving the red earrings & top Jess!!! Love the print of your top and the cold shoulder detail…so pretty! I really love the floral blouse on you. The colors are fabulous against your face and the red fringed earrings are dynamite. Those shoes look very comfortable and I also look for similar features. A rubber outsoke is very important for me. Have a wonderful week ahead. I finally linked up! Your top is so pretty and I love your earrings Jess. Such a pretty top, I love the retro feel it has. You look beautiful wearing it and the red earrings are just the perfect touch. Jess, That top has the sweetest details with the ruffles. I love it and it goes perfectly with your ON jeans (I had to look to see what kind they were because they look so good, I should have know they were our beloved Rockstars) Love the tassel earring too and the shoes. I know they are the start of the post, but for me the star is you!😉 Happy Tuesday! I am so interested in this top. I love the long open shoulders. Is that elastic around the openings? These sandals look comfy and have a nice edge.No sandal weather here, yet. Good morning! Oh, for the love of Poppies! What a wonderfl print and, of course, I love your “Love” bag. I wish it would warm up here so I could wear lighter clothes. Have a great week, Jess-lovely as usual. Absolutely love your top, Jess! The colors are gorgeous on you! I think the sun has something against everyone these days as spring and warmer temps just don’t seem to want to arrive…at least in Wisconsin. I love seeing you in jeans. That top is stunning. Love the color. And those shoes! Wow! I love that they are so stylish yet I can see by looking at them how comfortable they would be. 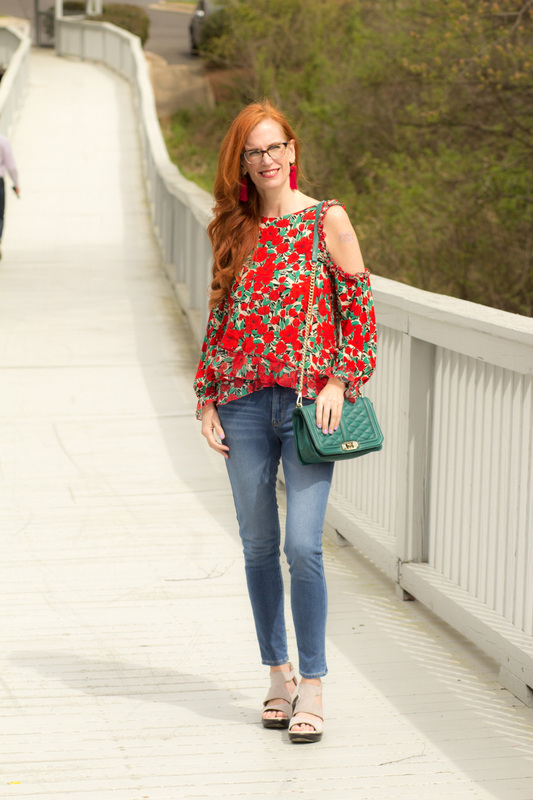 Loving this beautiful poppy print blouse! The red is so vibrant and eye catching and perfect for spring. I am also a huge fan of Rockstar jeans – they are just so comfortable and fit well. Your new sandals offer a lot of visual interest and I can see them being quite versatile, as well as comfy. How beautiful do you look in red? I love this blouse, the cut out, color and patterns are just gorgeous! I know what you mean about the weather, Jess!! It can make it so hard to get good photos, but yours look terrific!! Jess, I love red on you! What a pretty top. And you know I love when you style jeans, too! You are so adorable! Such a great look. Florals are always my favorite on you! Love the pop of fun color from that fab bag too! Jess this is so beautiful! I love every piece of this look. This weather, what is up with it? I am so ready for spring! Happy Tuesday! This top is so fun! and I LOVE sandals with a zipper in the back. Makes it so much easier than a buckle. I adore your top Jess, it is beautiful. Thanks for hosting. That is one of the prettiest tops I have ever seen!! Great sandals, looks so chic with the jeans and Fabulous YOU!!! Hope you’re feeling much better! You look fabulous in red Jess! Love the jeans on you too, they are so flattering on your long, slim legs – you look like a supermodel! Your shoes look super comfortable. I would really like to try a pair of Jambu shoes, I’ve seen some really cute styles lately. 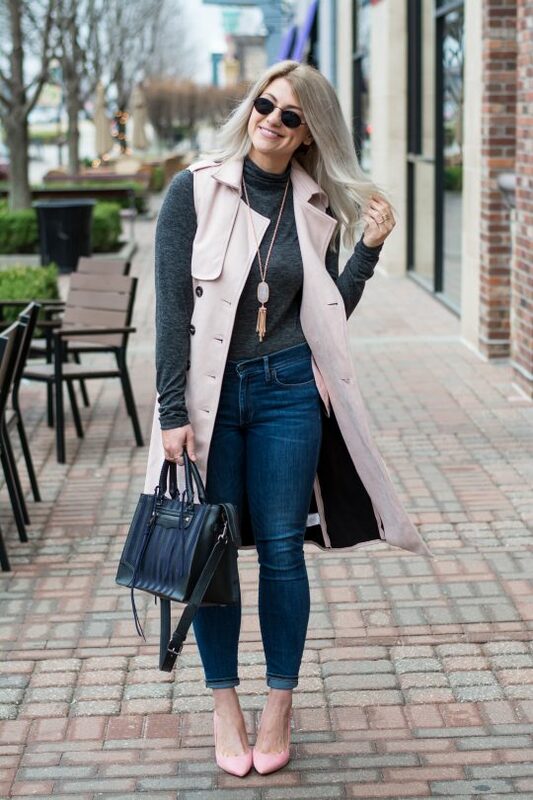 I love a good neutral shoe – goes with everything! I love everything!! Love the ruffled details on that top, and the way the purse matches perfectly! Those sandals are so cute too! I love your floral top! The print is beautiful and I like the pops of red. Your green RM bag is gorgeous too. Yep the weather is still a bit weird over in the neck of my woods too. It was warm yesterday but raining today…. Very nice top! Floral prints always suit you so well! I know what you mean about the weather, Jess. It’s the same here in Portugal too! Today there is heavy rain… again! I’m ready for some sunshine! Tell me about the weather Jess! Non stop rain here in LOndon is causing problems! Your shoot has turned out perfectly though and you couldn’t have styled those sandals better. Beautiful top & really cute shoes! Pity about the fickle Spring weather as you look perfect for a sunny day. Love the poppy top, tassel earrings , bag and sandals. Happy birthday to your husband , enjoy the concert. Beautiful poppy print top! Fab sandals too – I love the stylish and comfortable style of Jambu shoes. Happy birthday to your hubby…hope you have a great time at the jazz festival! Hope you have had a brilliant weekend 🙂 We had a busy one, some Church Online people flew over from the US so the weekend was full of activities, we had a party at my place last night which was fun! No wonder you fall in love with this top! So did I! It is amazingly beautiful! My hubby’s birthday is this week too! Wednesday he will be 67. Love this look on you. Those Jambu shoes are cute!